Every day my 91-year-old mother picks up her morning newspaper from the front door of her apartment in her Mississippi retirement home and the first thing she does is turn to the obituaries! It's not a morbid fascination, it's just because she is at that age where most of her friends and peer-relatives (her husband of 55 years, her only brother, etc.) have passed on. Last year, my wife's father died at the age of 93, and she is still finding acquaintances and distant relatives who were unaware of his passing. Many folks like to remember deceased loved ones with a piece of jewelry--typically a pendant or locket worn close to the heart. One customer recently ordered a gold locket, which she had us engrave with a friend's husband's birth and death dates--she was buying it on behalf of a group of friends who were going to present it to the widow as a memorial gift. Photo lockets make it easy to keep a picture and perhaps a lock of hair from your loved one. 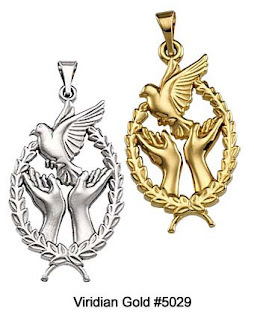 We also offer several silver and gold memorial pendants and necklaces in our Religious and Family pendants section. A beautiful example of such a pendant is the expressive "Wings of Remembrance" design, symbolizing the release of death. It's pictured here and is available in white and yellow gold, as well as affordable sterling silver.